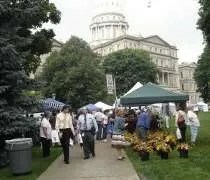 The Select Michigan Capitol Lawn Farmer's Market in the shadow of the Capitol Building. We’ve been a little bad so far this year. J and I haven’t really taken advantage of the countless number of Farmer’s Markets in the area. I work most weekends now, so the time we have together in the morning is usually spent searching out new restaurants. Last year, we trekked downtown for both Select Michigan Capitol Lawn Farmer’s Market’s and when I saw some Twitter activity about the event yesterday, I asked J to set the alarm clock so we could get up and go to the Capitol. When the alarm went off, we both had a hard time moving. It was morning, but it was still so dark. We finally did roll out of bed and got moving. We made it downtown just before noon and found a parking spot about a block away. I grabbed the reusable shopping bag out of the back and we started working our way around the sidewalk in front of the Capitol. The first thing I noticed is that there was a lot more packaged products this year. There were multiple stands selling honey, BBQ sauces, jams, and spice rubs. There were also a lot of potted plants. We walked around for a little while before coming up on the first produce stand where J found some cherries that looked good. We picked up a pint for $2.50. This stand was packed with people and it took a while to get what we needed. Once squeezing our way through the crowd, J noticed a stand selling kettle corn. We picked up a bag of that for $3.00. The last thing we bought was a head of red leaf lettuce for $2.00. That one will save us a trip to Meijer tonight before dinner. Most of what we buy at Farmer’s Market is produce. We don’t buy a lot of the packaged goods. I make a lot of my own sauces and spice rubs. We will buy bread every now and then, but the only loaf we found was over $4 for a loaf of white bread, so we passed. It’s still a little early in the growing season and we are going to be out of town this weekend, so it didn’t make sense to buy a lot of food. Still, what we came home with was great and we will continue to look forward to the next time there’s a market on the Capitol lawn.